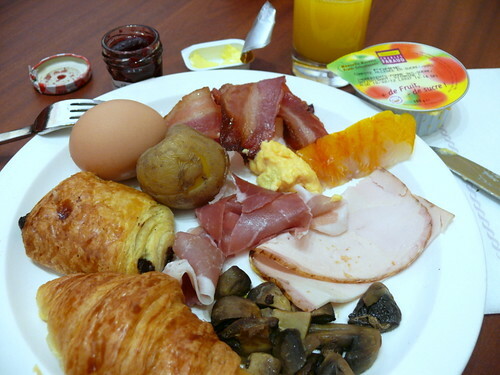 Breakfast on tour was always good, with lots of ham and cheeses. Trier is a small town somewhere in east Germany. It's a pretty little town known for being the birthplace of Karl Marx. We arrived on a Sunday morning about 9:30 and as in all Europe, everything was closed except the church. The church bells were ringing and we followed people dressed in their Sunday best into the Catherdral of Trier, a church that stands out in my memory because it didn't have much stained glass but a dome with figurines against a blue background that reminded me of Wedgwood ceramics. 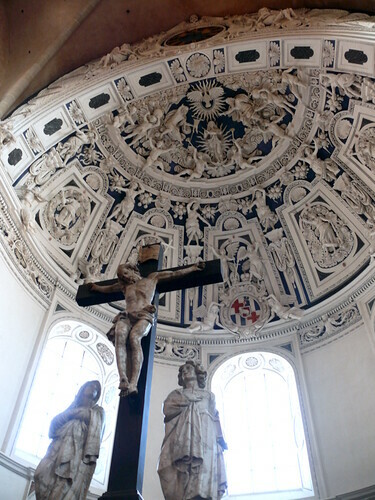 Jesus at the cross was under the dome. It is so beautiful I see it whenever I pray. When I visited huge, grand churches and cathedrals, I often wonder who the building glorifies, God or the people who built them. The focus is always about the stained glass, the sculptures, the way the building is built. 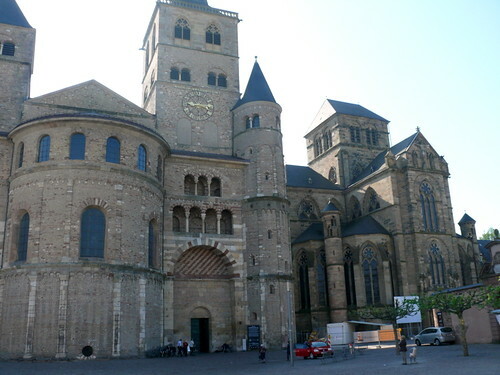 I didn't feel that about the Cathedral of Trier, which is the oldest church in Germany. 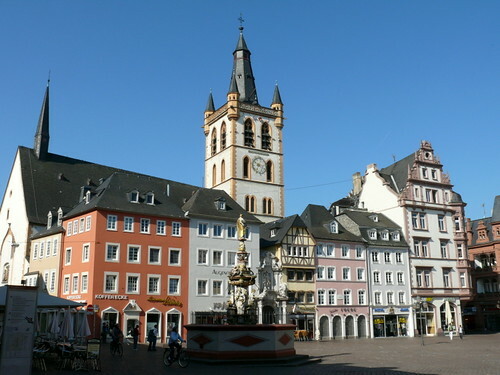 Not surprising since Trier is Germany's oldest city. It is believed that the city was converted by a man sent by Peter the apostle. The Catherdral of Trier doesn't have elaborate finishes. It looks rather like a small castle. Karl Marx's family home. A dress I liked. Sorry Karl that you have to share photo space. Nice little town square. Is this Koblenz or Rheims? 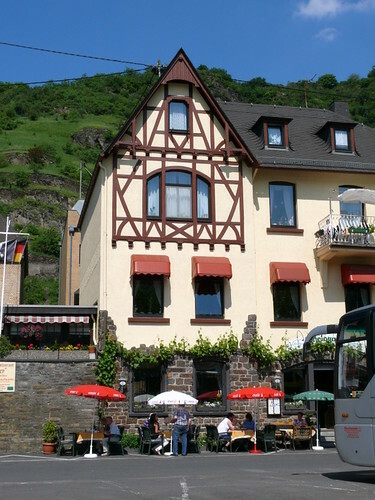 Lunch was at another German town, Koblenz, which is situated at the confluence of the rivers Rhine and Moselle. 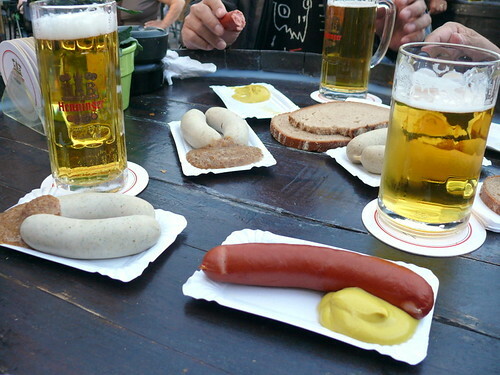 The tour guide arranged for the group to have a typical German meal. Since we had a full breakfast, we wanted to share a pork knuckle but no sharing allowed. For 20 euros each, this was a lousy deal. I advise that you skip this, tour the town and eat pork knuckle somewhere else. 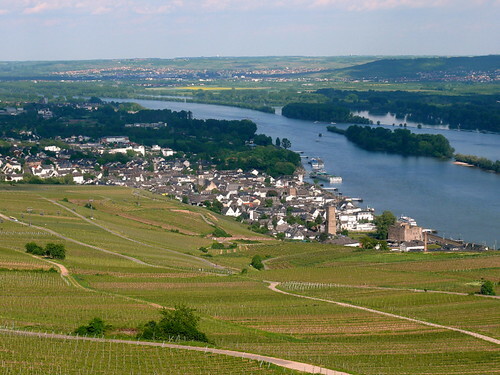 Another thing to avoid: cruise on the Rhine River. Yes, it was picturesque, little quaint towns and a sprinkle of castles on the hills but it was boring. I would prefer to drive along the region and explore the small towns. 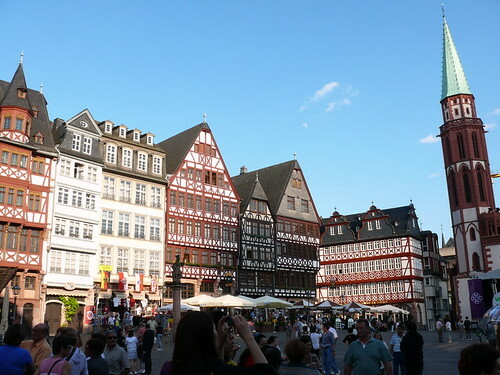 After that, it was a long drive to Frankfurt, a modern city. 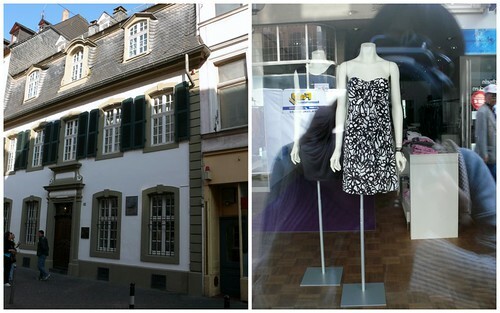 We arrived Frankfurt at 8 pm and all the shops were closed (Sunday) and the city deserted. The old town square was full of tourists so we sat down for some franks and beer. Love the beer. Hey Terri, the best knuckles I have ever tasted was in Munich city in Bavaria region where pork knuckles originate from. I guess like any big country, there´s regional specialty one should try but as you know, with travel agents, they usually arrange the country specialty even if its in the wrong region. I personally like Schweinbraten (roasted/braised pork), that´s been cooked for long, long time till all the meat is tender soft. I love them with sauerkraut and potato dumpling. The best currywurst you get in Berlin. I love your travel reports! 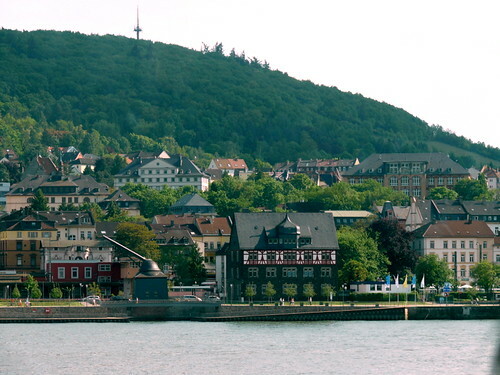 btw, in the pic it is Koblenz. ally: oh, i wish i'm going to berlin!ok, it's koblenz, thnx. feed me; let's go for at least 2 but make sure it's european beer or i get drunk easily. they r very strict here. i was in a friend's car a few days ago n straight out of the restaurant, there was a roadblock n alcohol check. lucky he didn't drink. they do have the best of the wursts, don't they? 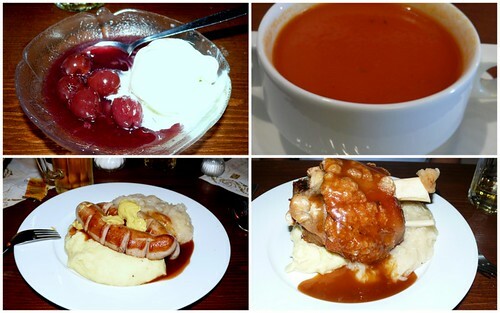 the last picture is very reminiscent of Slovakia for me, same style of presentation, none. K.I.S.S. = keep it simple stupid, seems to work. is the red colored frank in the foreground spicy? it looks like it would be. possibly a Debreziner style? might be a bit short, but the color is spot on. and that very yellow mustard, how would you describe it. i must have 10 different ones in my frig, can't get enough.